J&J Cigars - Cigar & Whiskey Pairing! J&J Cigars and Westland Distillery are getting together to celebrate the first release of the Westland Distillery peated single malt whiskey. For this event, we will be offering a whiskies and cigars tasting. Only 60 tickets will be sold for this event so please buy your tickets soon. 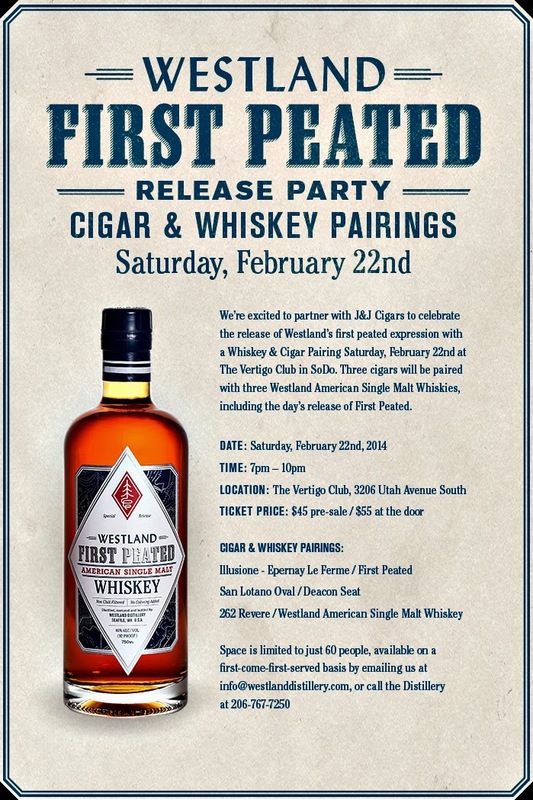 Tickets will be available at J&J Cigars and at the Westland Distillery store in SODO. 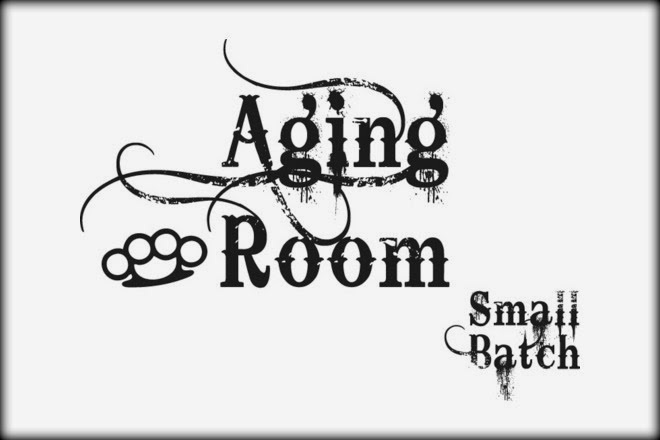 Lit Newsletter 2/12/14 An Exciting Announcement! Join us on Friday, February 21 from 6-8pm in Lit as we feature the #1 Cigar in the U.S., Aging Room! Ranked #2 in the world by Cigar Aficionado, only behind the Cuban Montecristo #2, the Aging Room F55 Quattro is a rich, and full bodied and features a unique Indonesian grown wrapper. We'll have specials on the F55 Quattro and the Limited Edition Aging Room Fortissimo cigar, as well as a special selection of prototype Aging Room blends. We'll be joined by Cary Bischoff of Boutique Blends, who produces Aging Room, as well as David Kearns of Beam, who will be showing off the latest in the Beam Signature series, a limited edition Spanish Brandy finished Beam whiskey. Try this or one of our other featured Small Batch bourbons from Beam along with a prototype Aging Room cigar for only $15 and share your review with Cary to help influence the next great Aging Room release! We'll also have a flight special of three Beam Small Batch whiskeys along with giveaways and the usual fun you get at one of our Lit events! We hope to see you on the 21st! 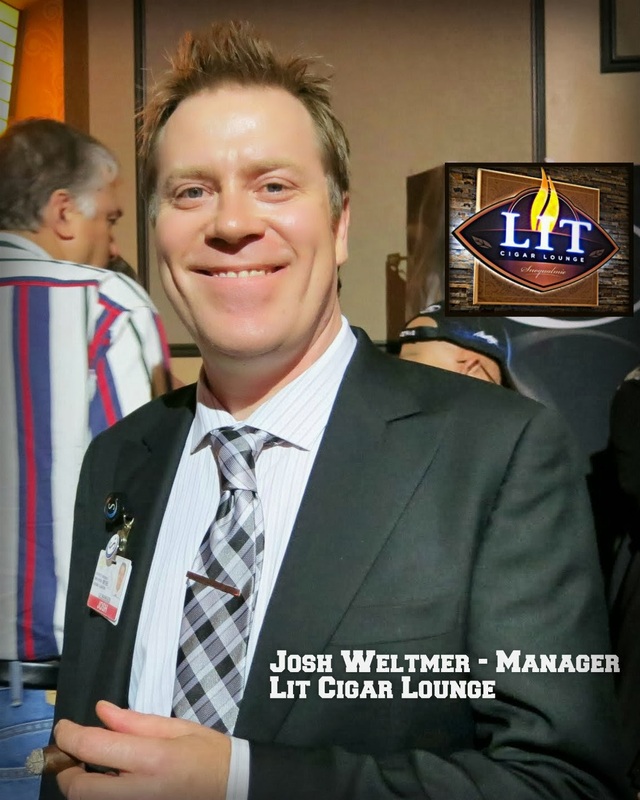 Due to the overwhelming demand for another large scale cigar event in the same vein as our annual Washington Cigar & Spirits Festival, we're proud to present the Lit Cigar Lounge Spring Smoke! On Friday, April 25 in the Casino Ballroom from 7-10pm, we'll present three exciting innovators in the Cigar & Drink world. 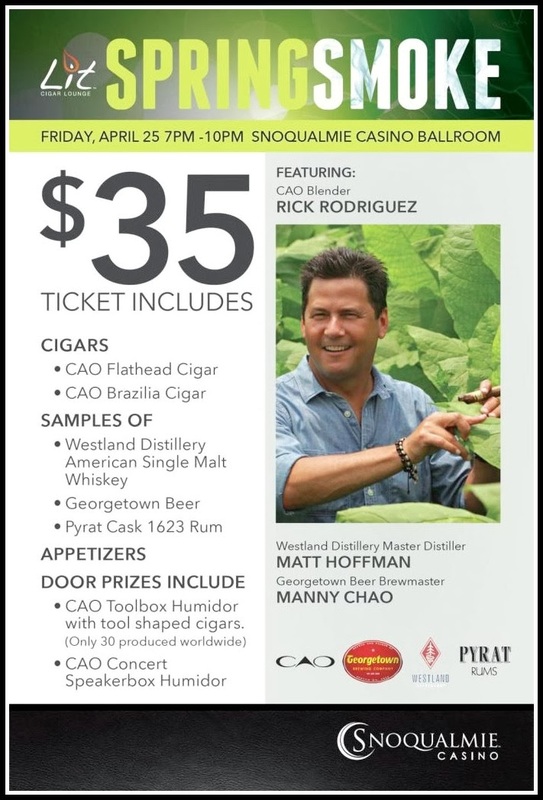 CAO blender Rick Rodriguez will be on hand to talk about his line of cigars, including the new Flathead which has become a mainstay for full bodied cigar smokers at Lit. Check out CAO's awesome website for more info on their cigars and Rick's passion for creating them. Westland Distillery's Matt Hoffman - Matt is the master distiller at Westland, the beautiful distillery located on 1st Avenue in the SoDo district of Seattle. Westland is unique in that they make American Single Malt whiskeys, using Washington grown barley and aging their whiskey in the cool ocean air of the Olympic Peninsula, which gives it a richer flavor and a longer finish, more reminiscent of scotch.Check out Westland's site to learn more, and if you can make it down for a tour, you will not be disappointed! We have two Westland whiskeys available at Lit, their Flagship American Single Malt and a limited edition whiskey called Deacon Seat. 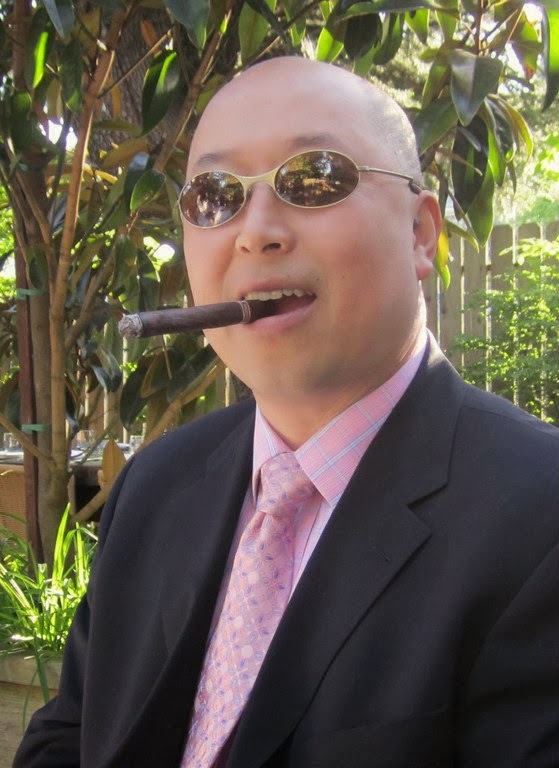 We're also going to be joined by Georgetown Beer's brewmaster Manny Chao, creator of some of our favorite beers to pair with a fine cigar. Manny's Pale Ale is the #1 beer in Seattle of course, but we love the Lucille IPA with a nice cigar as well! Tickets are $35 and include appetizers, products from all of these gentlemen, as well as a sample of the Pyrat Cask 1623 rum, a very exclusive and expensive sipping rum which will tantalize your palate! Tickets are on sale now at the casino box office! Seattle Seahawks Win 2014 Super Bowl! Well, they did it! The Seattle Seahawks have won their first Super Bowl! I had no doubt that they’d win, I mean after the first play of the game, when the Denver center hiked the ball to Manning, and the ball goes sailing over his head and into the end zone for a Safety. I mean really, how much better could the game have started out? Actually, a whole lot! It just got better and better from there. Unbelievable game and an incredible season! Best Season, Best Team, Best Fans! Saw this on FlightAware - check out the flight path of the Seahawk 12th Man 747, which was made over Washington State! 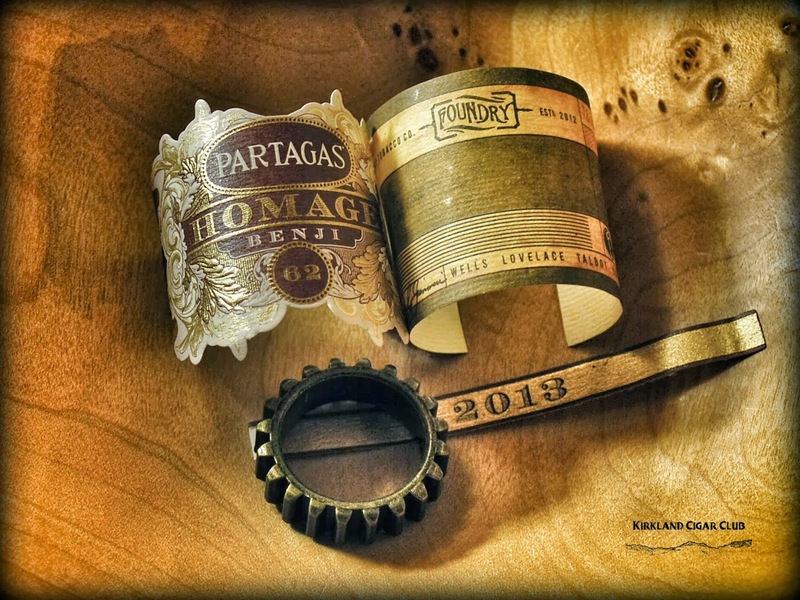 If they gave a prize for the best wrapped cigar, and I'm not talking tobacco wrapper, but wrapping, like wrapping a present, the Partagas Benji would win in every category. Beautiful presentation! Each cigar delicately wrapped in a fine tissue with multiple Partagas labels on the inside and outside wrappers - very, very nice job, and I'm sure it is very labor intensive to produce. However, that being said, it was not my favorite cigar from the bunch. No, even though this looks like it would be a stellar cigar - perfect size, shape, color, aroma, and that oily wrapper - it just didn't cut it for me. Maybe I didn't care for the full bodied taste? I don't know, maybe... The draw was also tight, and it didn't produce the volumes of smoke that I normally would expect. My rating: Meh... won't buy this again. I'll skip to the bottom line - Meh, didn't much care for it. I like the gimmicky sprocket ring, but other than that I wouldn't buy it again. Just didn't care much for the taste, smokes fine, just didn't like it. Lastly, the Rocky Patel Vintage 2003 CAMEROON. In my opinion, this is by far the superior cigar! I'm not really a Rocky Patel fan, but this one I loved! Draw, taste, amount of smoke, all incredibly good! Don't care much for the label, but the cigar is excellent. Now, just a disclaimer here, the above opinions are my own, your mileage and taste may vary, which I'm sure they will, but if your taste buds are like mine, check out the RP Vintage 2003 Cameroon - you are gonna love it! I swear! Thanks Richard for suggesting it!